When my father died, I honestly thought there was no way I would ever feel better again. The grief and pain were so powerful; his death changed me. For years, when I saw a dad holding the ankles of a little girl sitting on his shoulders, I'd have to go take a moment alone to weep. Sometimes, I'd smell a cigar, imagine him standing right next to me, and cry some more. I focused on the hole in my heart that I couldn't fathom filling ever again. Anyone who knew Michael Kennedy would agree he was larger than life. He'd fill a room with stories, laughter, and his gigantic personality. No one was like him, and I don't say this just because he was mine. When he left, my world seemed so quiet. I wondered how to make the sound come back as much as I wondered how Christmas could possibly feel good again without him there. The room, full of twinkling lights and presents, seemed frozen and mute, nobody knowing how to fill the empty space. The way I found out about his death also altered the course of my career. A television news reporter at the time, I narrowly avoided being assigned to cover the multi-car accident that killed my dad. On my way out the door of the television station that day, I recognized video of his mangled Chevy in a live report. My father, on his way home from a morning duck-hunting trip, got caught between a hydroplaning semi-truck and several other cars. In the video, I saw ducks scattered on drenched pavement around his barely recognizable pickup. Suddenly a part of the news I'd covered for years, I wanted to run away from the accident, my job, and looped images of my father's body underneath a yellow tarp. For a long time, I let pictures of the twisted hood of his truck turn in my mind. Night after night I vacillated between feeling grateful that I wasn't physically sent to the accident scene and furious that I didn't get to say goodbye. I still wanted to share so much with him. I needed time to make us better. At twenty-four, I took on an anguish and regret that felt like someone sitting on my shoulders. In the process of finally segueing out of television news and into teaching, I left to travel the world with my friend, Shannon. 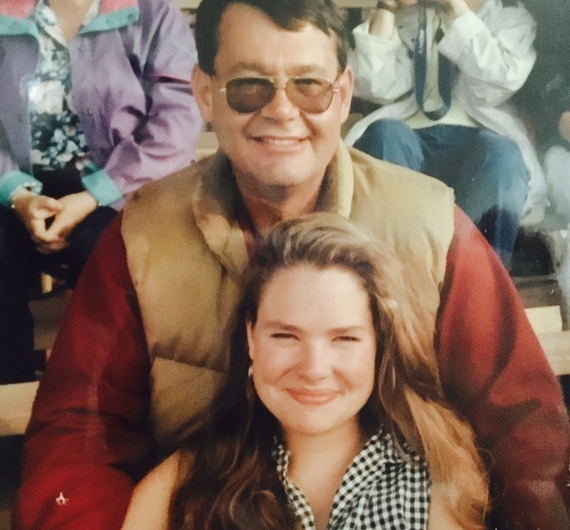 We planned to pen a book together, but that changed when I started writing and all that came out were stories of the highs and lows I experienced in struggling to connect with my father. Through writing on the road, I realized it wasn't the accident I needed to sift through; it was our tumultuous relationship. So, for six months around the globe, I wrote about him, dreamt about him, and struggled to somehow fix what I couldn't. In between diving into those depths, I experienced eleven beautiful countries with a hilarious and beautiful friend. On the trip, I bungee-jumped off the bridge that made bungee famous in New Zealand, lost my clothes in Costa Rica, swam with sharks in Australia, learned to cook in Italy and surf in Bali, got scolded for peeing in my wetsuit on a cave tour also in New Zealand, and overindulged on food, wine, and foreign men. 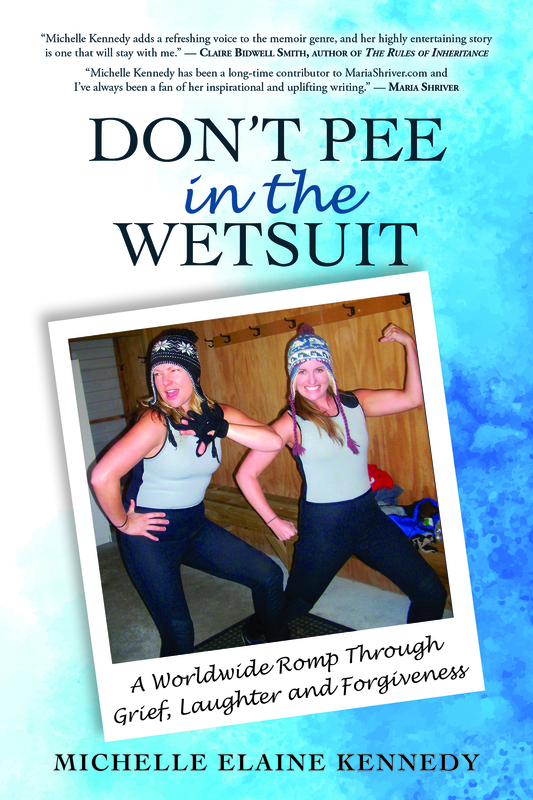 Blending reverent reflection with rollicking adventure, Don't Pee in the Wetsuit: A Worldwide Romp Through Grief, Laughter and Forgiveness, is a travel memoir about my attempt to make peace with my father on the trip of my life. I needed to acknowledge the invisible travel partner I'd brought with me on that trip of a lifetime. For years, I'd tried to forget the accident, our fights, and our highs and lows. I longed to escape and stop missing him, but now that I'd found my way to paradise, my father made his presence known in the sand beside me. He was there, forcing me to face him and the roller coaster relationship we never got the chance to fix. The journey showed me that we can heal through heartbreaking loss if we are brave enough to face it and appreciate people for who they were rather than who we wish they could have been. It also taught me about the grieving process. 1. That voice that tells us our grief will never go away, is lying. 2. Grief is a very personal thing that takes as long as it takes. 4. Exactly how we choose to heal is up to us. Don't Pee in the Wetsuit is available on Amazon and at mkennedywriter.com. This article was originally published on MariaShriver.com.